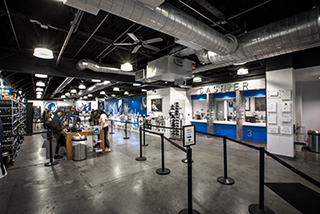 Rooted just blocks from the famous Vegas Strip, our flagship Nevada location makes it easier than ever to enhance your Vegas experience. 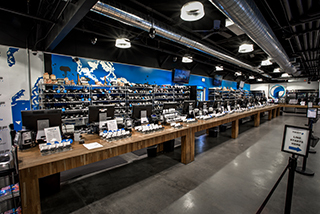 With a quick visit to our one-of-a- kind, top-of- the-line dispensary, you’ll quickly realize what Reef is all about. There’s simply nothing else like it. 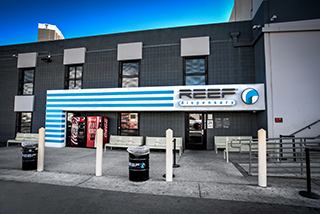 Getting Here: We’re conveniently located just off I-15 steps from the strip. However, we know that even Vegas locals have a tough time navigating the streets in our area. Choose where you’re coming from for detailed directions. We are located less than a mile west of Las Vegas Blvd (The Strip), adjacent to Wynn and Fashion Show Mall. If you want to avoid traffic on the strip, Frank Sinatra Dr/Industrial Rd is the secret route of Vegas locals and taxi drivers. It’s an access road that runs along the 15 behind the resorts on the west side of the strip. The parking lot is one-way, so drive past our front door and then turn left into the lot, and double back to park. You’ve arrived! At the stoplight, turn right onto Western Ave and you can’t miss Reef.